2019 Spring Releases Are Here! The 2019 Spring designs have been released and are in local stitching shops. Here are some details. Two models were stitched of this design - over two and over one. 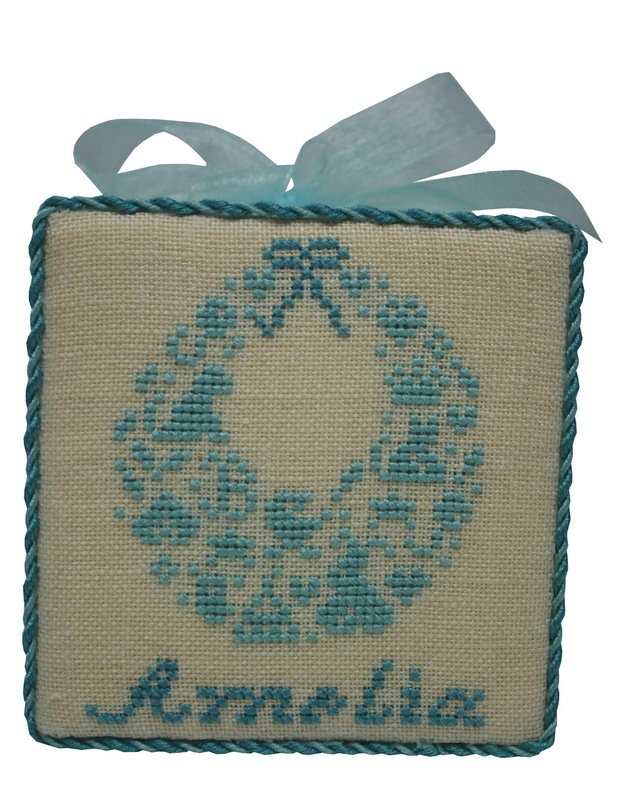 The 'over two' model was stitched on #32 Belfast linen in Blue Whisper and was finished as a small pillow, It is about 4 1/2" W x 4" H. The over one model was stitched on #32 Lugana in Navy and was finished as a small easel. The fibers used were DMC floss, but I can imagine this in many of the beautiful hand-dyed fibers. Once again I have stitched two models of this design, which has a stitch count of 138 W x 117 H. The lighter version (finished as a wall hanging) was stitched on a #32 Belfast Linen in platinum using a combination of Romy's Creations, Weeks Dye Works and Classic Colorworks fibers. The darker fabric selection was a #32 Belfast Linen in raw linen, and it was framed by Family Tree Frames in a lovely green. The leaflets include the five buttons which were used in the design. A lovely, but simple shower or wedding design, that could easily be adapted into a ring bearer's pillow. 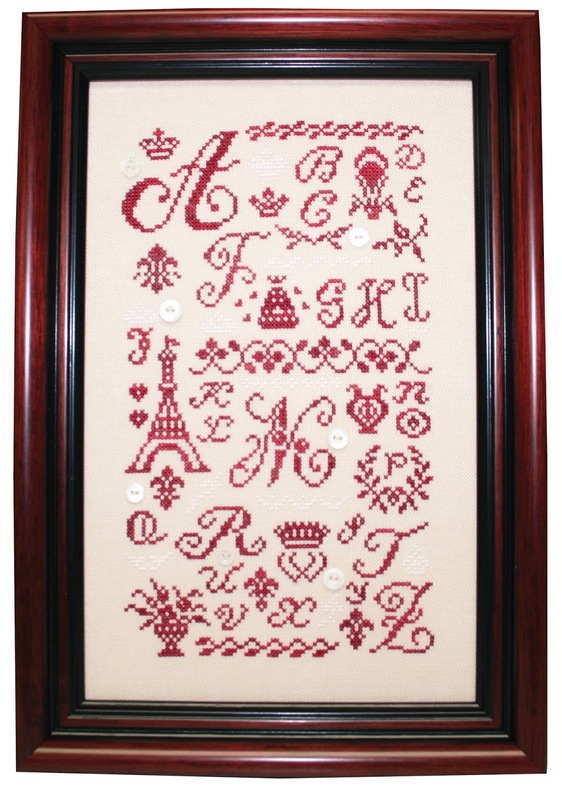 The design has been stitched on a #32 Belfast Linen in cream and has a stitch count of 109 W x 75 H. It has been mounted on a wooden box available from Hobby Lobby, that has been painted and lined with a coordinating fabric. Weeks Dye Works, Gentle Arts and Classic Colorworks fibers have been used. More lovely little sea creatures to add to your collection! This particular leaflet includes a lobster and a sea turtle, finished in a variety of ways. Both designs were stitched over two and over one. 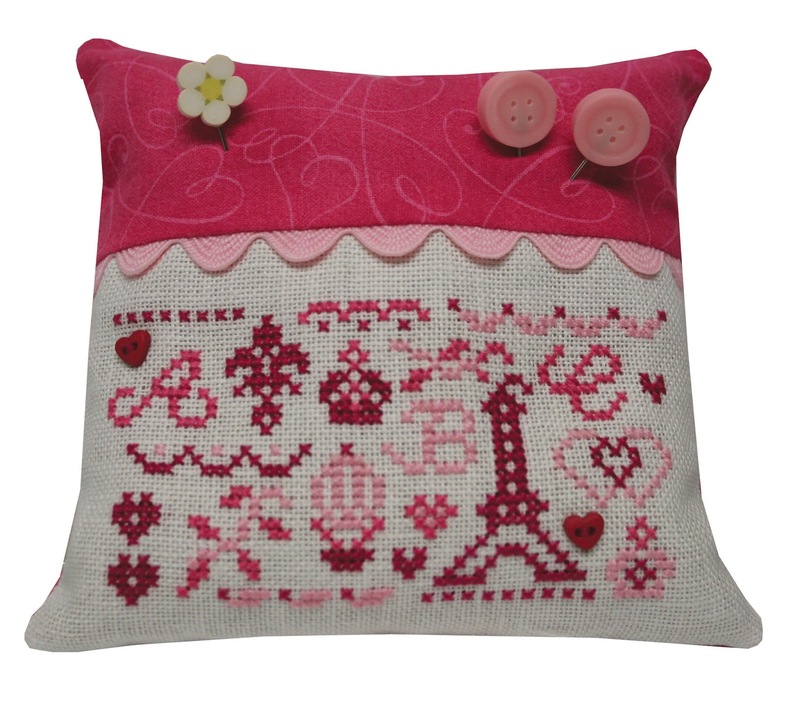 The lobster over two was stitched on a #32 Belfast Linen in Baby Pink. 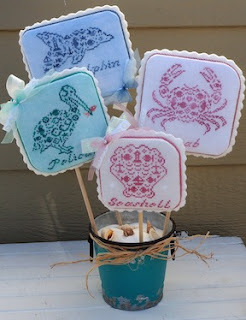 The sea turtle was stitched on a #32 Wexford Linen in the color Meadow Mist (by Silkweavers). Classic Colorworks were the chosen fibers. 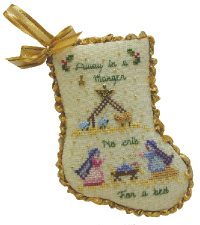 The 'over one' models were finished as felt ornaments, and the 'over two' models were mounted in an 8" square frame from Hobby Lobby. The sea gull and conch shell are contained in this leaflet and they were finished in a similar manner to Seaside IV: felt ornaments and framed. The sea gull was stitched on a #32 Belfast Linen in the color Vintage Blue Whisper (from Zweigart). The conch shell was stitched on a #32 linen in the color Elizabeth, from Fabrics by Stephanie, Classic Colorworks and Weeks Dye Works were the fibers used in these designs. 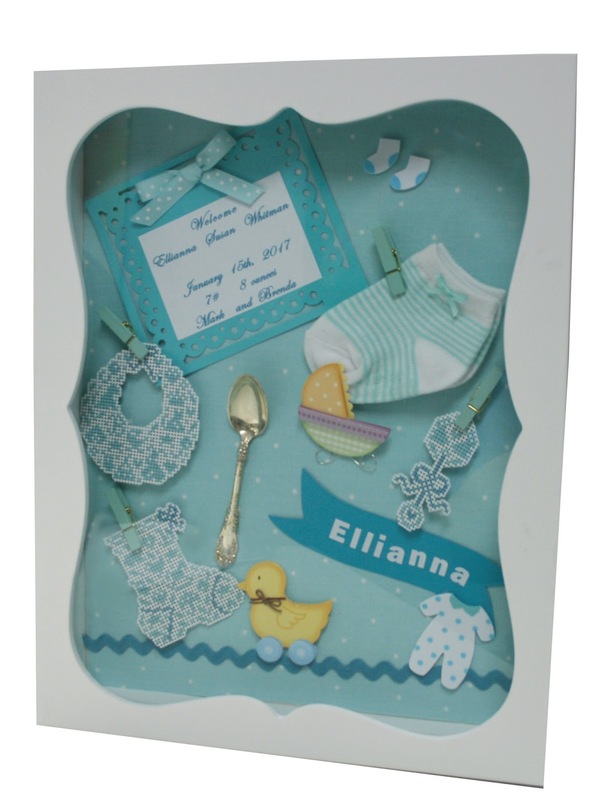 Baby designs are always popular and this little design would make a darling baby shower gift or it could be used as a baby announcement for the new mom. Two models were stitched of this design and are shown in the leaflet. The blue model was stitched on #32 Belfast Linen in the color Vintage Blue Whisper, and the pink model was stitched on #32 Belfast Linen in the color Baby Pink. A combination of Classic Colorworks, Weeks Dye Works and DMC fibers were used. They were each mounted as a hanging, using scrapbook paper for the background of the flat finish with matching twisted cording. 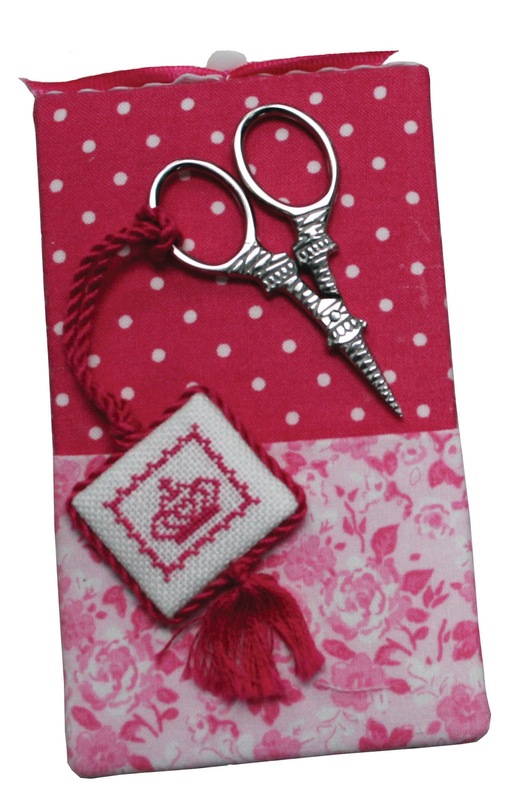 The final release is a kit for this darling scissors case and fob. The kit includes the linen, the backing fabric, floss for the cording, two buttons, the chart and complete finishing instructions. It's hard to believe that Christmas is just around the corner. To help you with your holiday decorating and gift giving needs, I offer six new holiday designs. Find these titles and more JBW Designs at your local stitching shop. 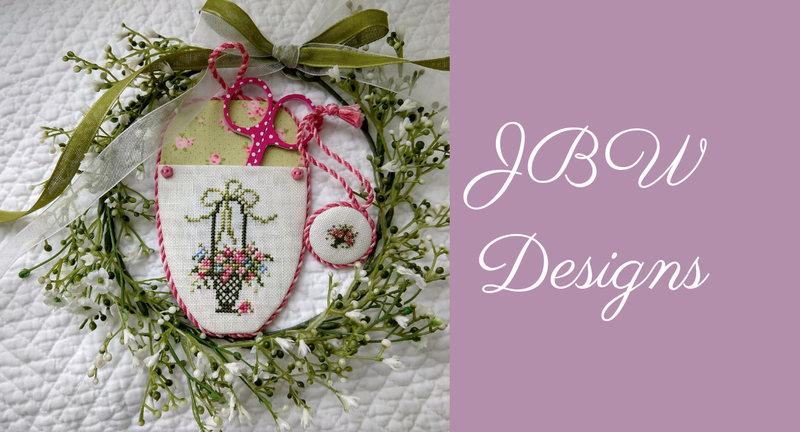 If your shop doesn't offer JBW Designs, ask them to contact me to place an order. Merry - It's a simple name but a classic and elegant design. 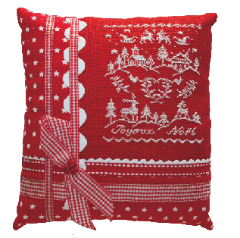 The design was stitched on #32 Christmas Red (from Zweigart) and #28 Jobelan - Christmas Red (from Wichelt). The stitch count is 198 W x 70 H - and the finished size on #32 is 12" x 4 1/2". One of the models is pictured as a bolster - which is such a unique and fun finishing method, and the other was finished as a long narrow pillow. It was stitched in white floss. 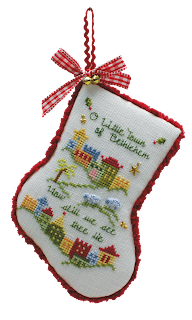 Sing a Song of Christmas VII (O' Little Town of Bethlehem) - Now onto a long title - but it is part of the popular little stocking series which features classic Christmas songs. The design was stitched on a #32 Antique White Belfast in a variety of fibers from Classic Colorworks, Weeks Dye Works, and Gentle Arts, but DMC equivalents are always listed. Three little brass charms are included in each leaflet. 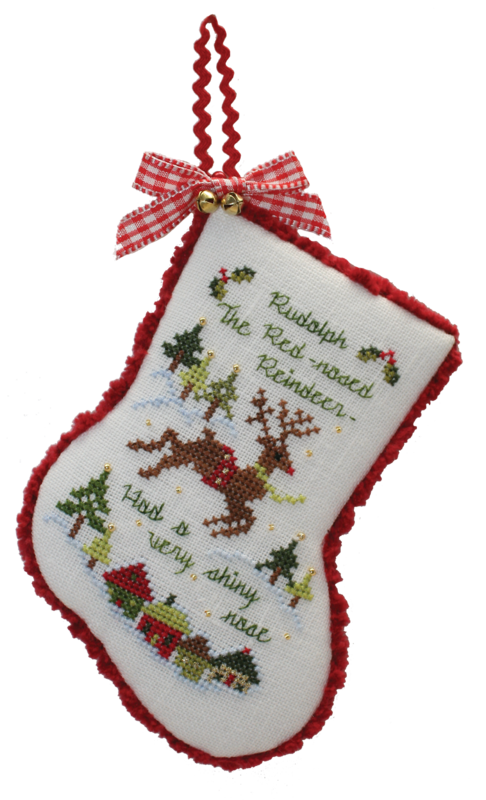 Sing a Song of Christmas VIII (Rudolph the Red Nosed Reindeer) - It's such a popular song that you may want to stitch one for each of your children or grandchildren. 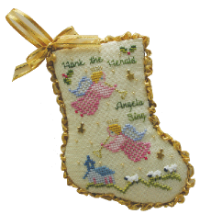 The design was stitched on the #32 Antique White Belfast again, and all of the designs are approximately 3" W x 4" H. It too uses a variety of hand dyed fibers, but also called for a #4 metallic braid from Kreinik, and two sizes of beads from Mill Hill: #00557 and #40557. 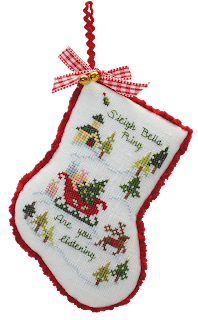 Sing a Song of Christmas IX (Winter Wonderland) - The verse I used on this little stocking is: "Sleigh bells ring - Are you listening?" and it too features a number of classic elements: a church, evergreen trees, a sleigh filled with presents, a tree, and a little reindeer. 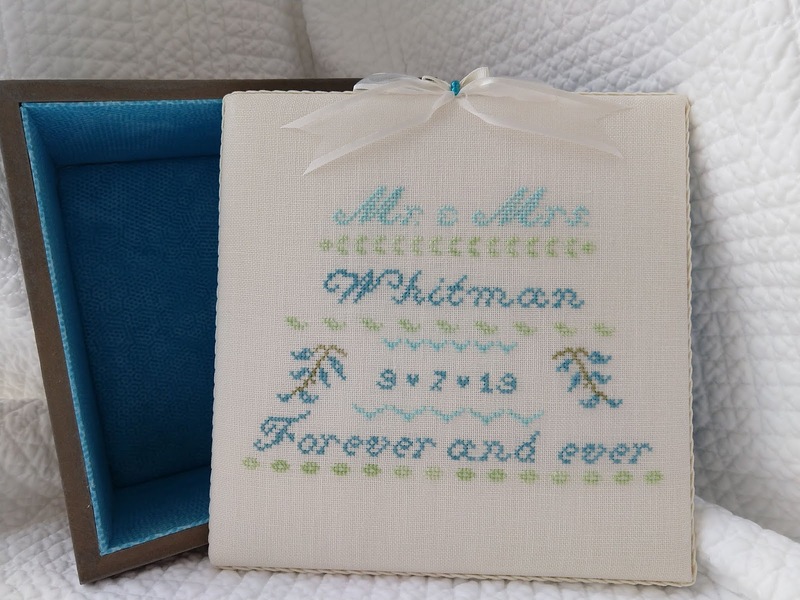 It was stitched on the #32 Belfast linen in Antique White and uses the same variety of hand dyed fibers, plus the #4 metallic braid and the petite gold beads. Sledding Santa - The little wooden sleds make such darling ornaments and Christmas decorations - that I couldn't resist designing two more pieces for the sleds. Although I did stitch a second model over one - and finished it as an ornament. 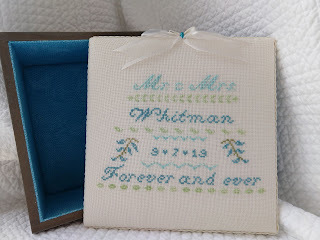 The design was stitched on a #32 Vintage Blue Whisper fabric from Zweigart, and measures approximately 1.7" W x 2.9" H - when stitched over two threads. A variety of hand dyed fibers were used in the original, but DMC colors are listed also. Each leaflet includes the embellishments: two brass stars and a pom pom. 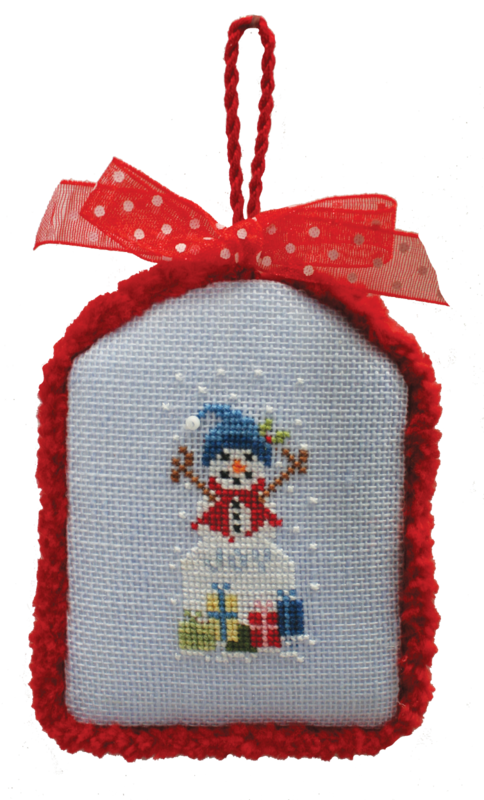 Sledding Snowman - These little sled designs are quite quick to stitch, and can be finished in an evening. We love projects like this which can be completed in just a short amount of tie. 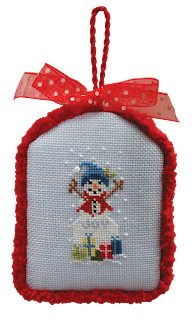 The snowman was stitched on #32 linen from Zweigart in Vintage Blue Whisper. The finished size is 1 1/2" W x 3" H on the #32 count. But I also stitched a second model on a #28 linen over one. Hand dyed fibers were used and the leaflet includes a pom pom embellishment. 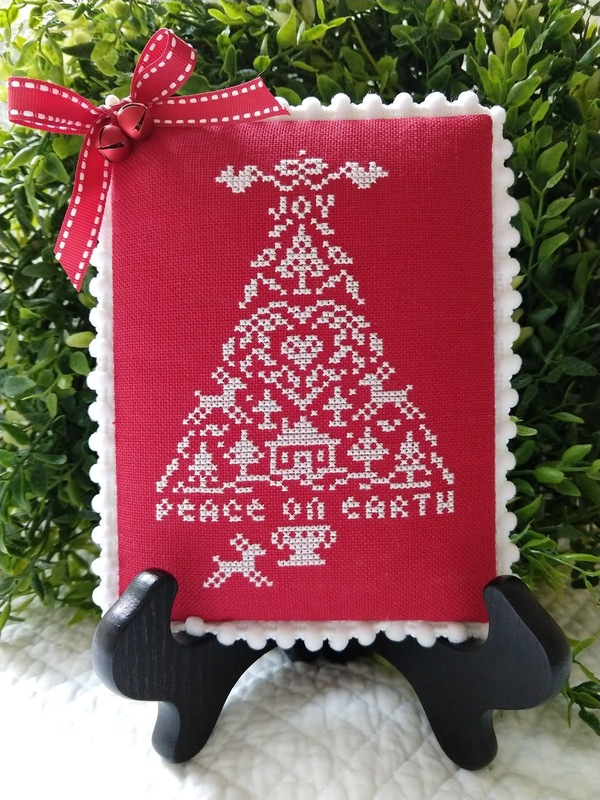 Peace On Earth Kit - The little white tree is stitched on a #28 linen - color Christmas Red. 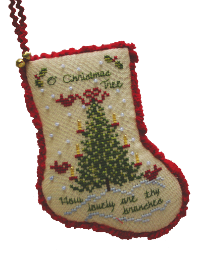 The kit includes the following: an 8" x 10" piece of linen, floss for stitching, the cotton backing fabric, a color booklet, needle, Dames of the Needle pom pom trim, 2 red bells, one long pin, ribbon and finishing instructions. 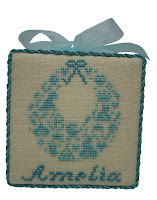 The design pictured was stitched over two threads, but could also be stitched over one thread and finished as an ornament. The finished size of the model on red over two is: 3.6" W x 5.5" H.
Joy Kit - Joy has been stitched on #32 linen - color Water Lily. The kit includes the following items: a 6" x 8" piece of linen, the cotton backing fabric, a skein of dark green floss for the cording, organdy ribbon, a jingle bell, pin and greenery, and the finishing instructions. 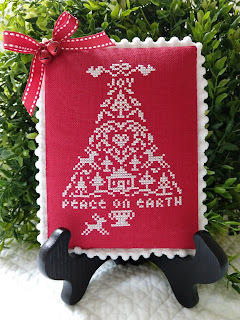 The finished size of the design over two is 4" W x 1 1/2" H. A model had also been stitched over one thread and would make a darling little ornament also. 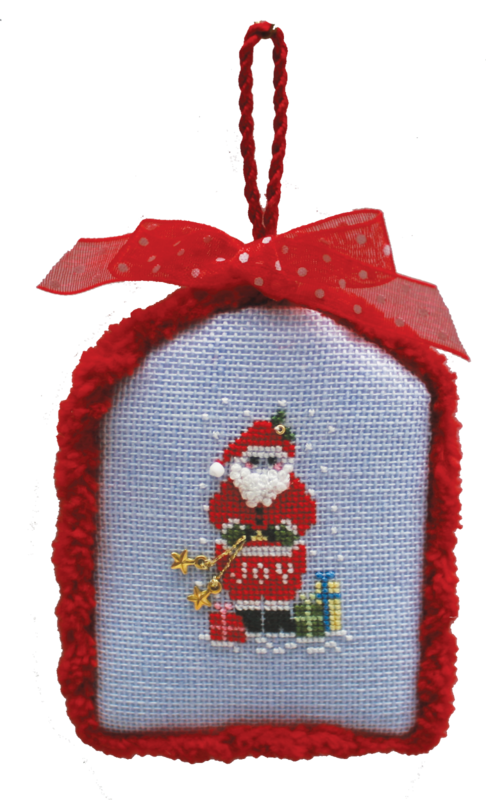 The Joy ornament is a companion to my ornament in this year's Just Cross Stitch Christmas issue. Look for the Noel - as it matches the finishing of this new kit. Summer 2018 booklets have been released! The finished sizes are: 2 3/8” W x 3 1/8” H and 1.3” W x 1.85” H. I stitched the model in Classic Colorworks and Weeks Dye Works fibers , but will always include the DMC equivalents in each leaflet. Complete finishing instructions are included for each of the models. Stitched on #32 Belfast red linen - in both the over one and over two models in a white DMC floss. Stitch count: Chalet: 35 W x 40 H, and Winter Wonderland is 39 W x 38H . The finished size of the over two models are about 2 1/2” round, and the over one models are about 1 1/4” round. The model with all three ducklings was stitched on #32 Belfast linen , in antique white and the Stitch Count is: 116 W x 71H. and the finished size is 7.2” W x 4.4” H. It has been stitched in a Romy’s Creations fiber called Squirrel. 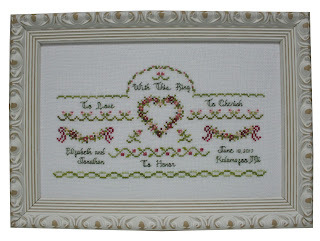 The frame is is from The Family Tree Frame Co.
Two other models were stitched using just the mother duckling as the design. The pink duckling was stitched on #32 Elizabeth - a pale pink from Hand Dyed by Stephanie, in the caller House Wine from Classic Colorworks. The yellow duckling was stitched on a #32 Belfast linen in a pale yellow - called Chrome - from Picture This Plus, in the color Candied Yams from Classic Colorworks. The stitch count of the single duck is 49 W x 57 H, and the finished size is: 3.1” W x 3.6” H.
An outline of the finishing instructions are included for all three pieces. 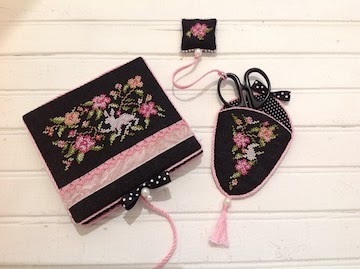 The finishing materials can be purchased at a fabric store and include a black and white polka dot fabric, pink and black ribbons, pink trims, felt, small rings and pearl buttons. Stitched on #32 Belfast linen in natural. The stitch count is: 105 W x 35 H. The fibers used were Classic Colorworks and Weeks Dye Works, but DMC equivalents are included. 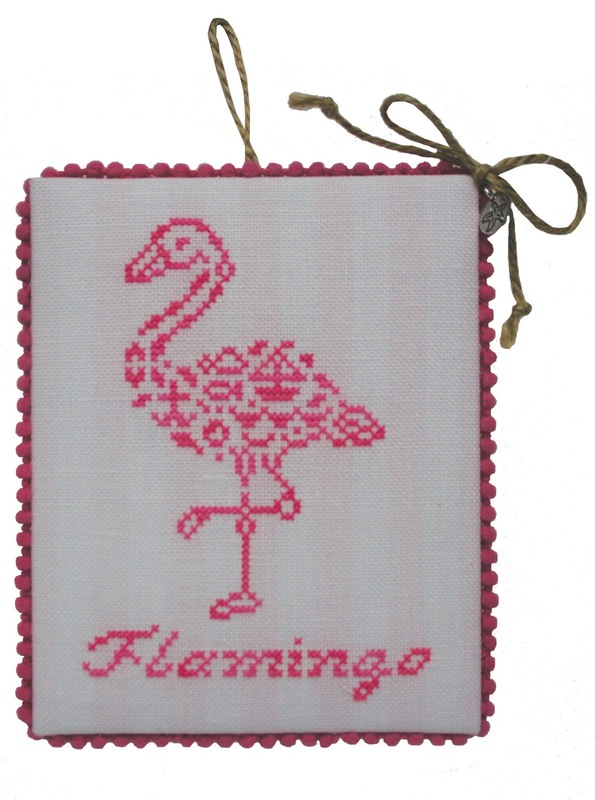 The finished size of the design is: 6.5” W x 2.2” H. The design has been mounted on a flat board with corded trim and finished into a felt pocket, with covered buttons. It was mounted on an antique bread board. As I write this, the sun is shining in Michigan and though it is still chilly outside, we hope that Spring is just around the corner. I have released four new titles and a limited edition kit this spring. Look for them at your local needlework shop! Ode to Britain - This is the second release in a series of travel themed designs. The first was Alphabetique which centered around France. Ode to Britain features many iconic British motifs (Big Ben, London Bridge, tea pots, an umbrella, double decker bus, phone booth) as well as Olde English lettering. It is worked entirely in one color - Cherry Wine from Gentle Arts. Seaside Series II & III - These next two booklets are a continuation of the Seaside Series started last year. I stitched models both over one and over two, and my finisher came up with very clever and creative finishes for them. The over two models were finished as plant pokes and put in a little tin pail (from Hobby Lobby) with sand and seashells. The over one models, were finished as a banner - which looks very nautical! Seaside Series II includes the pelican and the seashell. The pelican was stitched on #32 Seafoam linen from Stephanie's Fabrics using Peacock from Romy's Creations and Hibiscus from Weeks Dye Works. 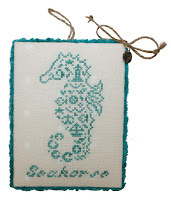 The seashell was stitched on #32 French polka dot linen from Yarn Tree in House Wine from Classic Colorworks. Seaside Series III includes the dolphin and the crab. 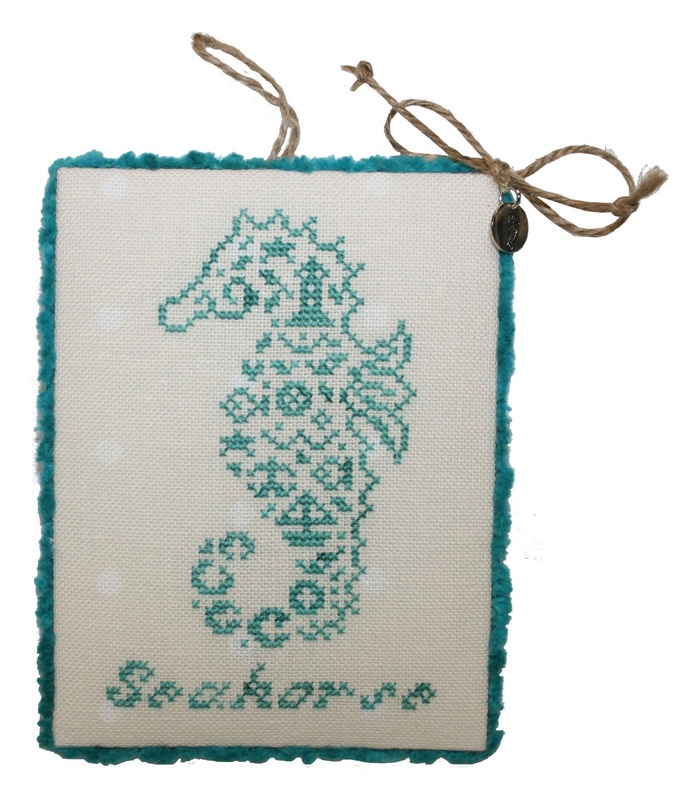 The dolphin was stitched on #32 Blue Whisper linen from Zweigart in Simona's Iris from Romy's Creations. 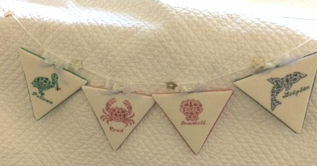 The crab was stitched on #32 linen from Picture This Plus in the color Bashful. It was stitched using Strawberry Parfait from Classic Colorworks. With Love - is a delicate heart made up of roses. Models were stitched both over one and over two threads. The model over one was stitched on #32 Cashel white linen in Romance from Weeks Dye Works. It was finished as a wearable pin. The model over two was stitched on #32 Picture This Plus linen in the color Petal using Pink Grapefruit from Romy's Creations. It has been finished as a box with lovely lace trim, ribbons and beads. Love Always - is a limited edition kit. This sweet little design could be used in so many ways. 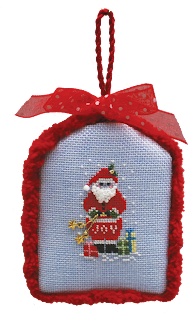 It has been finished as a small hanging ornament, but you could use it on a greeting card, a pin to wear, on top of a small trinket box . . . use your imagination! 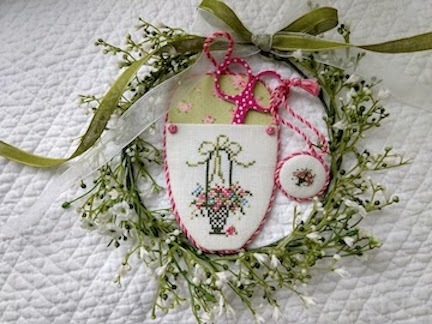 The kit includes a piece of #32 Belfast linen in antique white, the backing fabric, buttons, floss for cording, ribbon and complete finishing instructions to finish as pictured. 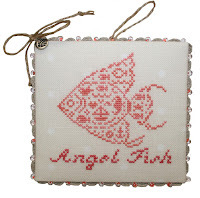 Contact your favorite needlework shop to find the new designs and kits. 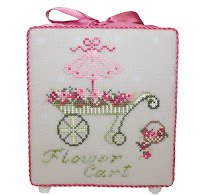 And don't' forget to share your finished JBW cross-stitch projects on our Friends of JBW Designs Facebook page. We love to see your creative finishes! It's that time of year again. The air is cooler, the leaves are turning and everything seems to be flavored with pumpkin spice. That must mean that the JBW Christmas designs have been released! So without further ado, I present this year's Christmas collection. As always, contact your local stitching shop to purchase the charts. 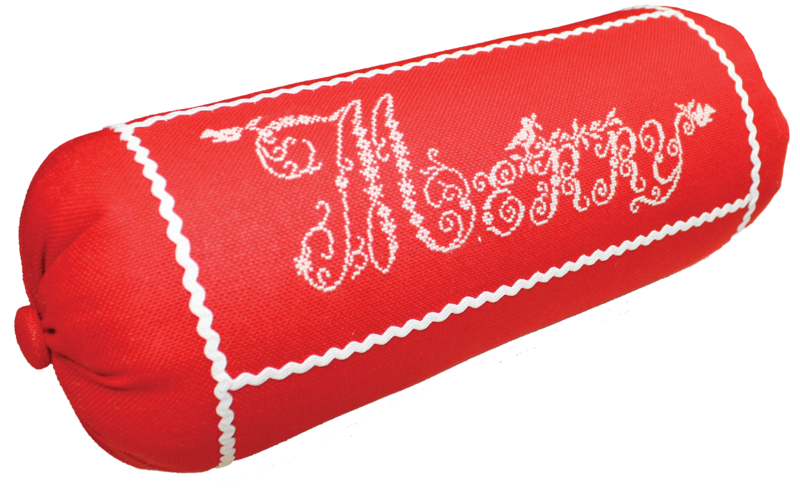 First up is Joyeux Noel #336 - The third design in a series of white on red Christmas designs. It has been stitched over one thread on #28 Christmas Red linen using DMC Snow White (B5200). Stitch count: 89W x 107H. Little Red Sleds #337 - Three designs are included in this leaflet and can be stitched either over two threads on #32 Antique White Belfast linen for the larger sleds or over one on #28 White Jobelan for the small sleds. Models were stitched using Classic Colorworks and Gentle Arts threads. (Sleds have been spray painted red). Sing A Song of Christmas IV-VI - The next three designs in a series depicting well known Christmas songs. 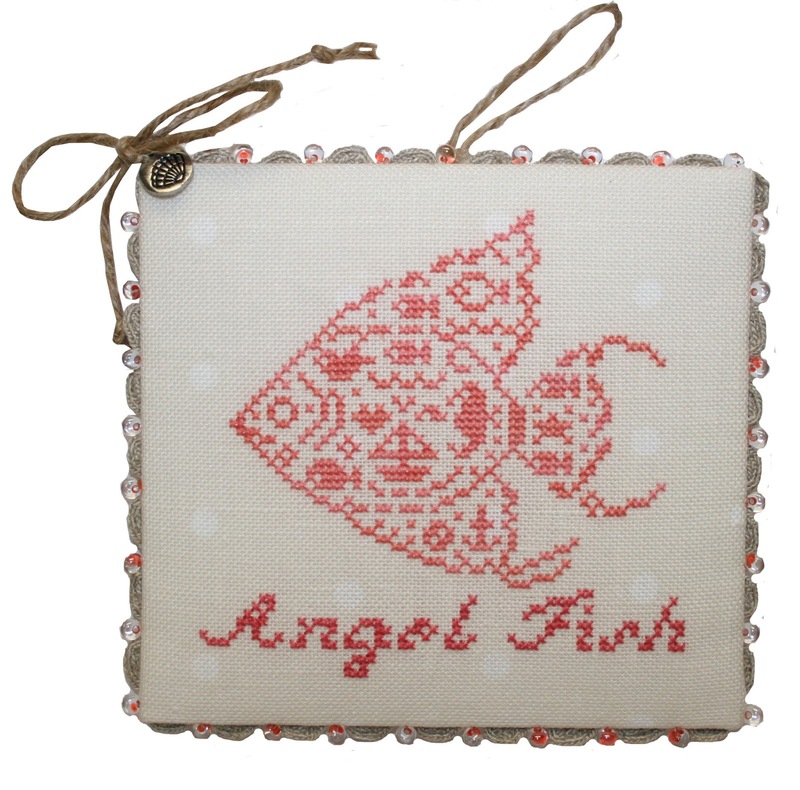 Each design has been finished as a stocking ornament. All three were stitched on #32 Belfast linen Latte using Classic Colorworks, Weeks Dye Works and Kreinik threads. 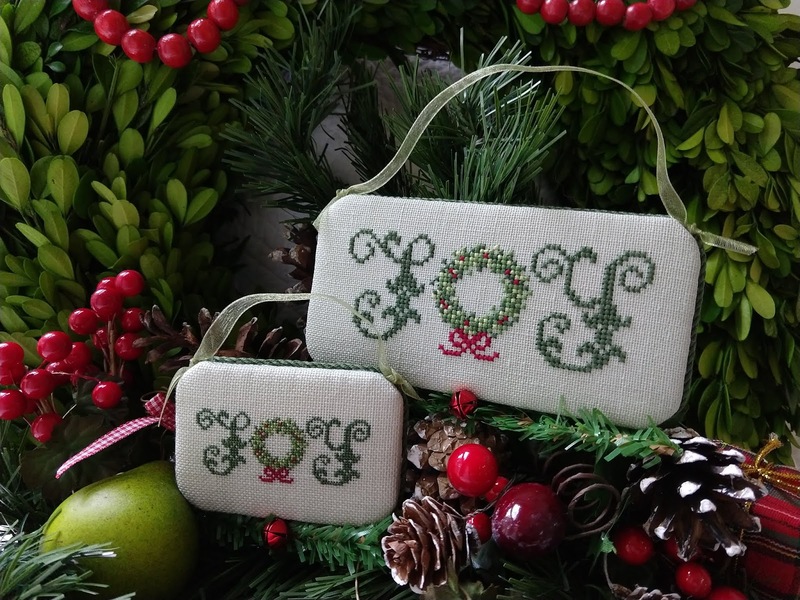 Sweet Christmas Bags #341 - Four motifs are included in this booklet and each one has been finished as a little sack. They are stitched over one thread on #28 Christmas Red linen using DMC Snow White (B5200) thread. The brand new Spring title have been released and are available at your local stitching shop. If your local shop does not carry them, please have them contact us to place an order. 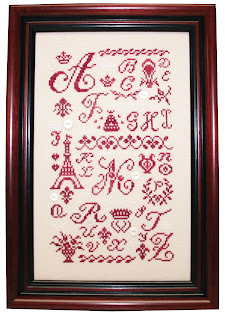 Alphabetique #330 - A beautiful alphabet combined with French motifs is stitched in classic red. The fabric used is #32 Belfast linen in the color Platinum. Sampler Threads (Cherry Wine) and DMC #B5200 were used to stitch the model. 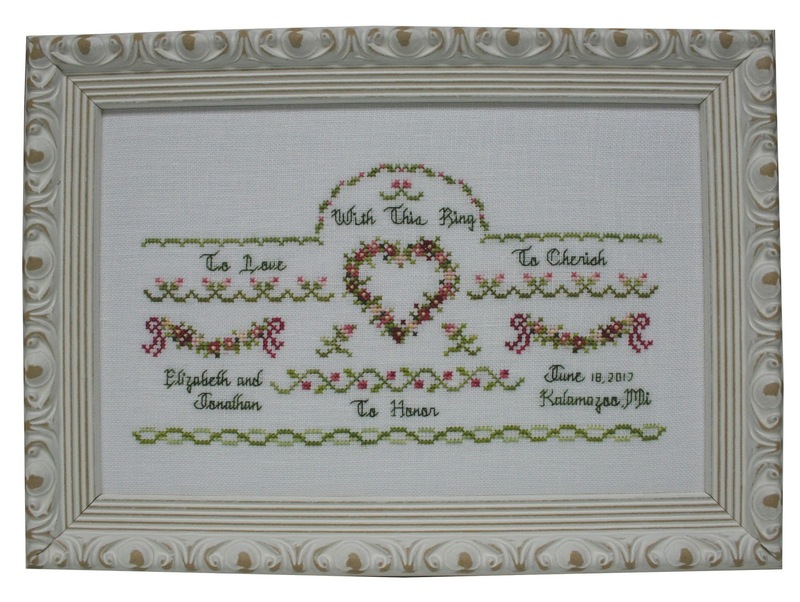 Baby Memories #331 - Baby Memories contains three motifs stitched on perforated paper and arranged with baby items in a shadow box. 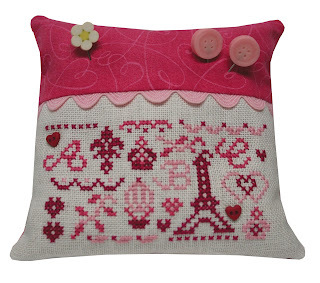 The motifs can also be stitched on fabric and finished as blocks, pillows, or hanging pieces. 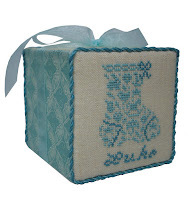 For the memory box, 14 count perforated paper was used and the blocks were stitched on #32 linen Country French Latte. DMC fibers were used. 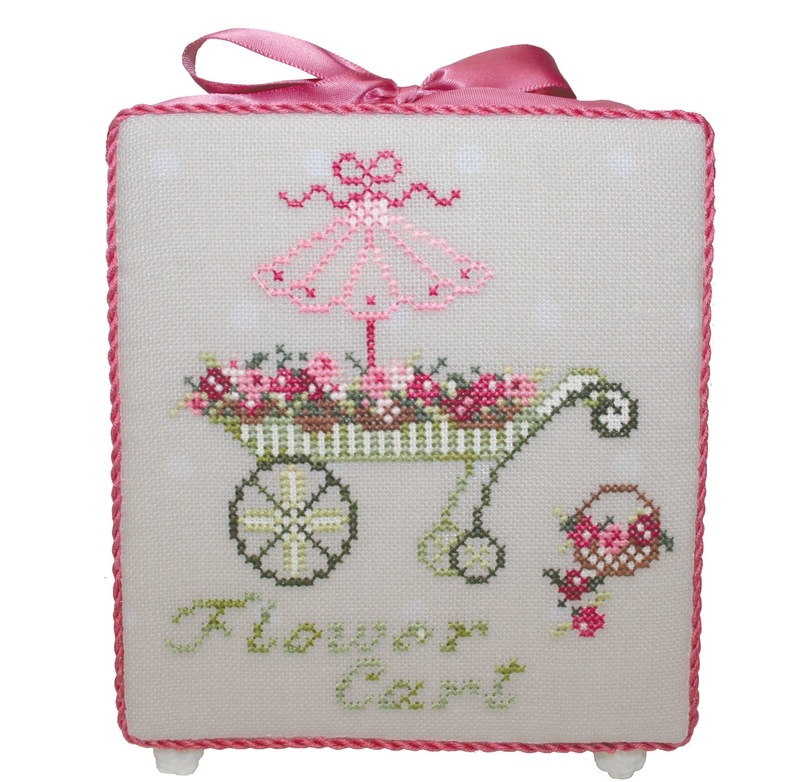 French Flower Cart #332 - This traditional flower cart was finished as a standing block. It was stitched on #32 French Polka Dot cream linen using a combination of Classic Colorworks and Weeks Dye Works fibers. 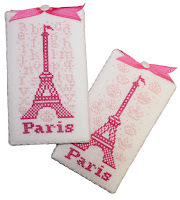 Ooh La La #333 - Ooh La La is a scissors case and fob that was released last year as a Limited Edition Kit. It was quite popular and to make it more widely available, we have released the charts in booklet form. The scissors case was stitched on #32 Antique White Belfast Linen and the fob on #28 Antique White Linen. DMC fibers were used. The stitcher has the choice of two backgrounds - alphabet or crowns. Full finishing instructions are also included. Seaside Series #334 - I got a little carried away stitching models of this design. 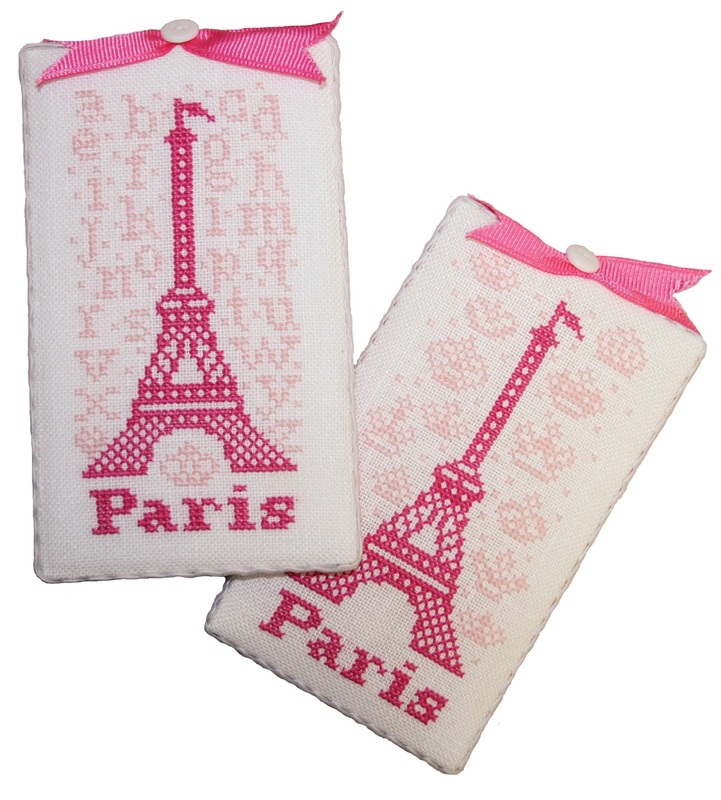 Models were stitched on #32 linen in French Polka Dot and French Stripe pink. They were also stitched over one on #28 linen. I also had some beautiful fabric from Hand Dyed by Stephanie - #32 Ice Crystal, Elizabeth, and Seafoam. Weeks Dye Works or Classic Colorworks fibers were used on the #32 or #28 linen. Fibers from Romy's Creations were used on the hand dyed fabrics. With This Ring #335 - Wedding season is upon us and this new design makes a lovely gift to commemorate the couple's special day. I stitched it on both #32 Belfast Antique White linen and #32 Belfast Flax linen. A combination of Classic Colorworks, Weeks Dye Works, and Gentle Arts were used.